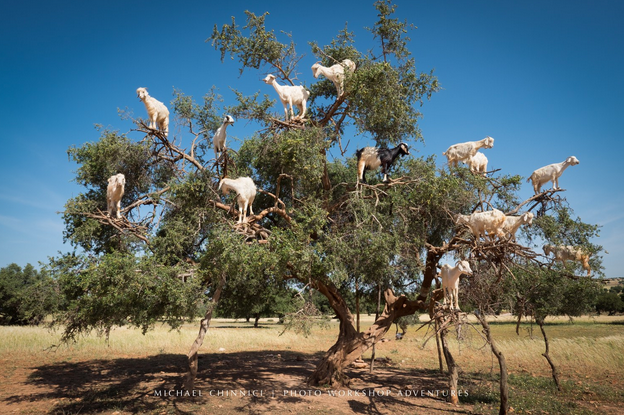 Let’s start with this fantastic video of Argan goats in a tree in Marrakech in Morocco (with thanks to the Modern Farmer enewsletter). Argan goats are named so because they like to climb the Argan tree – the source of Argan oil in shampoos and cosmetics around the world. How does the oil come about? Simple: the goats eat fruit from the Argan tree, then the kernels from the Argan fruit fall to the ground in the goats’ droppings, and everything is pressed into oil. It takes around 20-30 hours of cracking the kernels to extract 1 litre of oil. Those goats!! The boys loved them too!